I know the first question many of you have is, “Where the heck have you guys been?” Well, it’s holiday time and things have been quite hectic. Writing time (and reading time) have been limited by preparations for everyone to come over for Thanksgiving. Now, I helped out quite a bit, but I’m sure Wendy would like me to do more. I try, though. With a big family and numerous siblings and cousins on her side of the family, we need to make sure everything is well picked up to fit everyone comfortably into the house. While cleaning up my disaster of a work area before Thanksgiving, I ran across a photo of all my cousins and siblings posing together for a quick family photo. It was taken at my dad’s mom’s house (MeMe’s house) on Christmas, 1988. My brother and I were wearing Buffalo Bills shirts from their AFC East Championship. 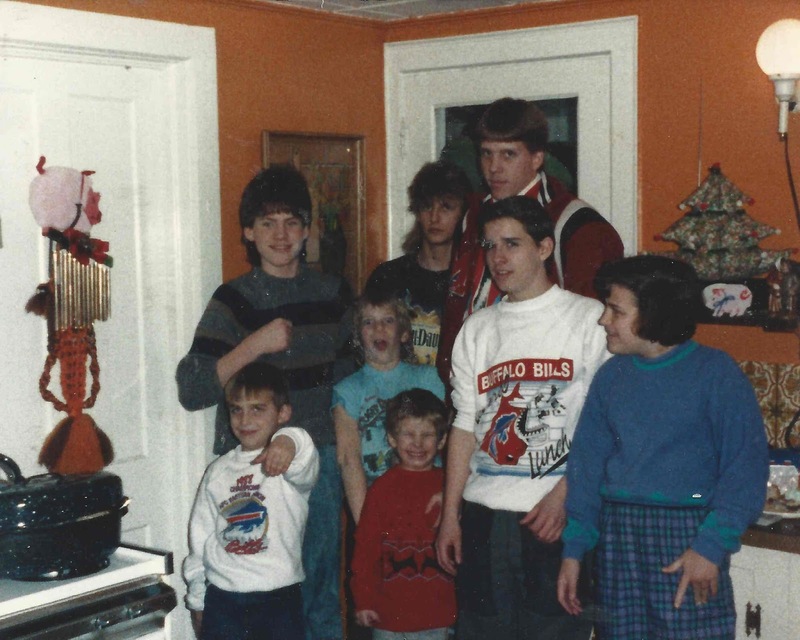 That may be the only picture of me wearing a Bills shirt. This was the last year we were all together. Shortly after that, my aunt and my cousins, MIke. Jason, and Jacob moved to Florida. My cousin, Mike, later died after a car accident in 1992. In the photo, my brother is making some weird hand motion, while my sister looks like a 1980s Yuppie, not even glancing in the direction of the camera. My youngest cousin, Jacob, has that winning smile that broke hearts across Florida, Georgia, and Wisconsin. His older brother, Jason, has a strange look on his face as he tries to act goofy. It’s good to see nothing has changed. Meanwhile, our cousin, David, is pointing at himself to make sure everyone knows that he’s the Man. In the back, Charlie and Mike look like they’d rather be anywhere but in front of a camera. Mike seems like he is trying to partially hide behind Charlie. It looks like that as the picture was being taken, he was slowly moving behind his older cousin. Charlie, while looking annoyed that he was to take the photo, is proudly sporting his Medina High School varsity jacket. He definitely earned that. There is a broad spectrum of attitudes in this photo. In all honesty, we’re mostly all teenagers. Our family was lucky that we even all got together in one place. And some of us are even smiling. I love this picture. I’m glad I found it. I posted it on Facebook early Thanksgiving morning. Immediately family members began to comment on it. Seeing that photo and watching the conversations grow from it took me back to those days. I can picture in full clarity, the orange walls of the kitchen, the dark paneled hallway between the kitchen and the living room, and the orange beads that “closed” off the stairwell to the second story. I can still hear the cacophony of voices as all of us got together to play with new toys, fight with siblings, and were told to quiet down. I think mayhem is the perfect recipe for the perfect holiday. No matter how much we complain about the noise and the annoyance of getting everyone together, those are the moments that stick out most in our memories. That endless craziness is what we talk about the most when we discuss the “olden days” with our kids. Wendy commented this morning that we should have taken a snapshot of everyone together while they were here yesterday. I never even thought about it. Photography is slowly dying. Even though we have more and better means with which to take pictures, it’s rare that they’re ever actually printed out for posterity. Instead, they sit on our phones until forgotten, or posted on Facebook for a momentary rush of fame before fading out of our minds. Some of my favorite memories growing up was looking at family photos from earlier times. I’m awful at taking pictures, so my kids won’t have those same experiences. No matter how hard I try, those best of intentions to make sure photos are taken never seem to work out. That makes me sad. That is my own fault. Someday, my kids will look back and wonder where their candid shots growing up went to. Right now, they’re in my mind. Sometimes I wish there was a way to capture those moments from your memory. Sure, those memories are always a bit rose colored, but they’re simply what we want to remember, in our own ways. They’re the things that can make us smile, even on our darkest of days. They are powerful things. Even modern holidays have changed in our house. Ever since we bought our house in 1999, we’ve been the homebase for most of the holiday celebrations. In the early days, the nephews were very small, and needed a lot of attention. As they got older, our house became the place to be as I would play videogames with all of them. Later, those games faded away as they got old enough to play cards. Both these activities are some of my favorite times around the holidays. Now, as the nieces and nephews have started to grow even more, games and cards are traded for girlfriends and boyfriends. Their focus is on another person as they prepare to move forward to make their own traditions. It’s kind of sad, because I like playing around with them. Honestly, the holidays are some of the only times I sit down and play videogames. I have fun, even if they smoke me in almost everything we play. While we children are playing around, the real adults are having adult conversation and planning on exactly what they need to accomplish on Black Friday shopping. There’s a whole plan of attack. Wendy goes to bed early and the alarm goes off in the middle of the night so she can meet up with her sister and her mother. Sometimes, even my sister goes, when ever she happens to be home. Ironically, my sister called this week, and she was talking about how she was going to miss going shopping with Wendy this year. As I was thinking about how to end this, I took a walk around the house for a little inspiration. Atop the toaster oven in the kitchen, is the wishbone from the turkey yesterday. Pulling on the wishbone when I was younger was a special occasion. At grandma’s house, she would grab one end, and one of us kids would grab the other. You had to make a wish as you pulled. The person who got the bigger piece was supposed to have their wish come true. With a house full of vegetarians, this doesn’t happen anymore. I was surprised to even see it in the kitchen. But I still have a wish. What’s my wish? I wish we could hold onto these special moments for just a little longer. I hope that my children and my nieces and nephews look back on their holiday experiences as fondly as I do mine. I think we've made some fine, lasting memories for them to think upon when they tell their kids about their experiences growing up. And finally, I wish everyone looks on the bright side of life and greets each day with a smile. There is far too much negativity already. Craig Bacon is thankful every day for his family and friends. He's also thankful that some of you keep coming back to read his writing.